A political cartoon from the 1840 U.S. Presidential campaign, which offers several illustrations of the techniques described here. View a larger image. The description of the cartoon by the U.S. Library of Congress reads, in part: "A Whig campaign print, showing William Henry Harrison greeting a wounded veteran before a log cabin by a river. A coonskin is tacked to the side of the cabin, two barrels of hard cider stand by, and a farmer ploughs a field in the distance. 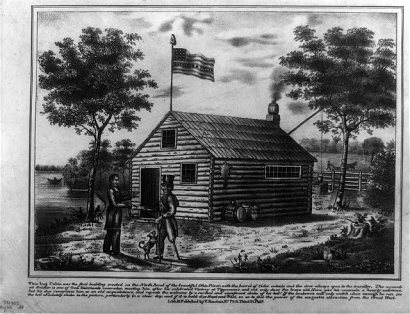 The text below the image describes the scene: This Log Cabin 'was the first building erected on the North Bend of the beautiful Ohio River, with the barrel of cider outside and the door always open to the traveller.'" In the campaign, between the Whigs and Democrats, Democrats cast Harrison as provincial and out of touch — an old man who would rather "sit in his log cabin drinking hard cider" than attend to the duties of office. This was a reference to Harrison's having retired to his farm after his defeat in the campaign of 1836. In effect, Democrats were rewriting history by depicting Harrison's dignified retirement as a retreat into alcoholism. 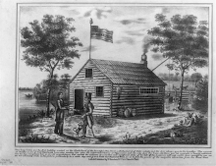 In response, Harrison and his vice presidential running-mate, John Tyler, adopted the log cabin and hard cider as campaign symbols to appeal to the common man, as depicted in the cartoon. It was in this campaign that the Whigs used the memorable slogan, "Tippecanoe and Tyler too." Tippecanoe was a nickname of Harrison, referring to a military victory he crafted as a general in 1811. Finally, to create distrust of the Democrats, the Whigs, in reference to the Panic of 1837 under the Democratic incumbent President Martin van Buren, took to referring to the President as "Van Ruin." Photo courtesy the U.S. Library of Congress American cartoon print filing series. Creating distrust in oneself is easy — tell a few lies, originate a few nasty rumors, dishonor your commitments, and then get caught at it. But creating distrust in others — and getting away with it — takes real talent, because the obvious ploys often backfire. For instance, telling a lie about someone else might work for a while, but people might someday learn the truth, and when they do, they often realize where the lie came from. To give people reasons to distrust someone else, and get away with it, you must be in the right place, with the right set of tools, and use a little bit of cleverness. This essay isn't intended as a handbook for the ruthless, but it's written that way for clarity. I hope that when you sense yourself beginning to distrust someone, you'll suspend judgment until after you determine whether anyone is using any of these techniques, or anything similar. With that cautionary note, here are some methods for creating distrust of someone else. We'll call the target Tom. Repeating any good news about Tom, his accomplishments, or his abilities undermines your goal. Never give your target anything of value for free. Although questions aren't actually accusations, and therefore need no evidence, they can nevertheless have the effect of accusations. At every opportunity, raise questions about Tom's talents, his situation, his past, his intentions, or his prospects. If opportunities to raise questions don't arise, create some. If any others can do what Tom can do, extol their capabilities. Elevating potential substitutes makes people comfortable with Tom's eventual disappearance or exclusion. Tom becomes less important. Minimize Tom's past accomplishments by re-interpreting or inventing history. The elements of the past most suitable for this purpose are those that reside mostly in people's memories, with a minimum of factual evidence to contradict your assertions. have the effect of accusationsquestions about Tom, your assertions about his past, and your praise for his competitors at every opportunity. People need frequent reminding and re-enforcement before they can truly internalize your misrepresentations. Build a tight connection between the idea of Tom and reasons for distrusting him. A crisp, short slur that captures one or more of Tom's supposed negative attributes makes your campaign "sticky." Rapid execution of multiple techniques tends to overload Tom's ability to respond with defensive tactics. High tempo also saturates the audience's ability to process your charges and Tom's defenses. After all, everyone does have other things to do. See "When Over-Delivering Makes Trouble," Point Lookout for December 5, 2012, for an additional behavior that erodes trust. Would you like to see your comments posted here? rbrenKSuDFwDCMrpRoqeUner@ChacaKTtqcmoPwcRXMqKoCanyon.comSend me your comments by email, or by Web form. I offer email and telephone coaching at both corporate and individual rates. Contact Rick for details at rbrenVlVYlBJNvJpDVjZLner@ChacVZcZCXDlyInthwgyoCanyon.com or (650) 787-6475, or toll-free in the continental US at (866) 378-5470.